A tortured summit with a fine panoramic view, Knockanore looms large over the golfing Mecca of Ballybunnion. Picture from Peter Walker : Well, I wasn't going to put up a pic of the graffiti about Ballybunion, was I? Picture: Well, I wasn't going to put up a pic of the graffiti about Ballybunion, was I? After the previous day in the Knockmealdowns had become a minor epic of mist and gale-force winds, of pitch darkness and headtorches, and astronomy...there's are definite benefits to Knockanore. As Mr Three5four0 says, you can drive to the summit, parking either as he mentions before the final bend on the access road, or being impossibly lazy and going right to the end of the road from where it must be a good ten yards or so to the highest point (the split-level concrete pillar rather than the triangulation column). 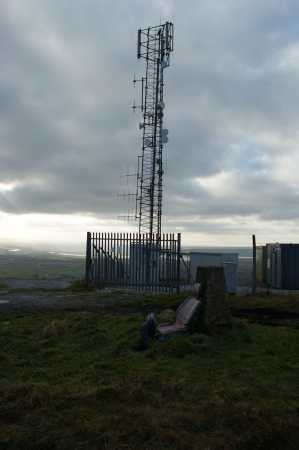 It's a tortured summit to be sure, both in the major (all the ancient telecomms paraphernalia) and minor (see photo) details, but as the highest thing for a large distance it does score highly as a viewpoint: miles and miles of coastline and acres and acres of lush farmland are arrayed for your contemplation. Coming as I do from England (where we don't have proper rivers) I especially noted the scale of the Shannon as seen from here: broad and majestic indeed. Picture from TommyV : Looking out on the Shannon estuary with the Loop Head peninsula in the background. 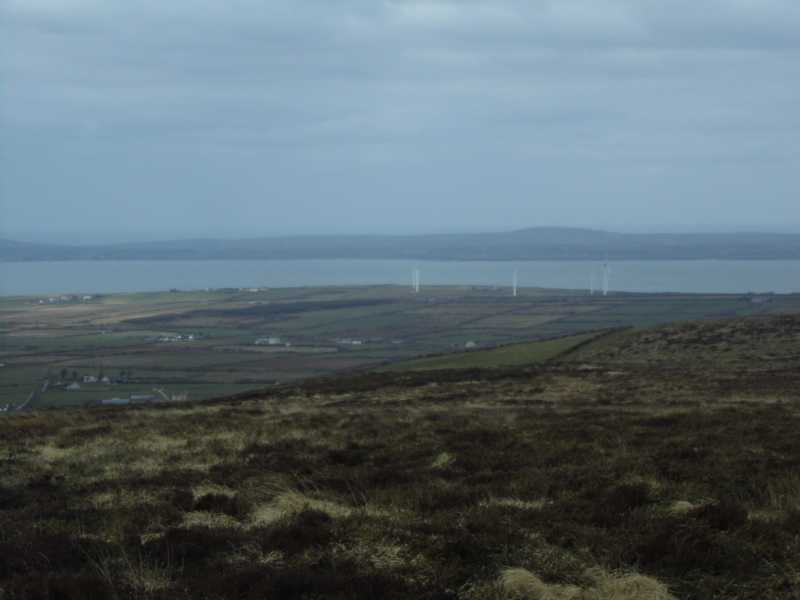 Picture: Looking out on the Shannon estuary with the Loop Head peninsula in the background.